Enter our giveaway for a chance to win Train to Busan on Blu-ray Disc! Winners will be announced on or about February 17, 2017. 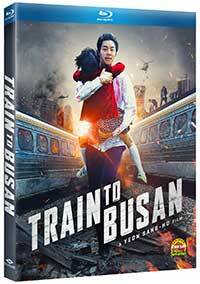 Win a Copy of Train to Busan!!! HOW TO ENTER: The Sweepstakes starts on or about January 27, 2017 at 11:00 a.m. Eastern Time (ET) and ends on February 10, 2017 at 11:00 a.m. ET (the "Sweepstakes Period"). To enter visit http://www.theaterbyte.com/contest/busan and follow the instructions to complete the official online entry form ("Entry"). All required Entry information must be completed in full and must be accurate, current, true and valid. The Entry information must match the information of the entrant that completed the act of physically entering the Sweepstakes. If an entrant’s contact information changes after he/she submitted his/her Entry, it his/her responsibility to contact the Sponsor at https://www.theaterbyte.com/contact and provide his/her new Entry information (to be received within 2 days of the Sweepstakes end date). Entries must be received by 10:59:59 a.m. ET on February 10, 2017. Sponsor's computer is the official clock for purposes of Sweepstakes participation. RANDOM DRAWINGS: Two (2) potential grand prize winners will be randomly selected from among all eligible Entries received. The potential winner will be selected in a random drawing within 2 weeks of the Sweepstakes end date. The potential winner (or his/her parent/legal guardian if he/she is a resident of a jurisdiction that deems him/her to be a minor) will be notified by e-mail If a potential winner cannot be reached after a reasonable effort has been exerted, if he/she is found to be ineligible, if he/she cannot or does not comply with these Official Rules, or if his/her prize or prize notification is returned as undeliverable, such potential winner will be disqualified, and an alternate potential winner for such prize may be selected at Sponsor’s sole discretion. Sponsor, whose decisions are final and binding in all matters relating to the Sweepstakes, will conduct the drawing. By participating, entrants agree to abide by and be bound by these official rules. WINNERS LIST/OFFICIAL RULES: For a copy of these Official Rules or the Winners List email sweeps@theaterbyte.com with the subject line “Official Rules Request – Train to Busan” or “Winners List Request– Train to Busan” respectively.